The Rockport Double Mail post will endure a lifetime and bring years of enjoyment by adding to your homes exterior beauty. 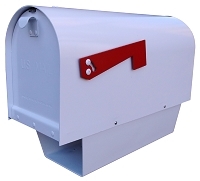 The Rockport mailbox post is ideal for sharing with a neighbor or multi family units. It also features two newspaper holders! Size: Width 37.5" Height 56.5"
Available Colors: White, Granite, Black, pictured in Clay; please select finish below. 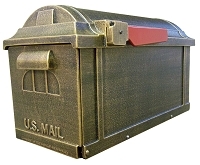 The Rockport mailbox post has a 15 year manufacturers warranty. The mailbox, mailbox mounting kit and a 4" x 4" required post is not included. Usually leaves warehouse in 3 days or less.